Those of us who have been gardening with Panicums probably aren't at all surprised that Panicum virgatum 'Northwind' has become so popular. It's an outstanding native grass with a graceful upright form, year round beauty, deer resistance, cold and heat hardiness, good wildlife value, drought tolerance and soil adaptability. It's been named the 2014 Perennial Plant of the Year™by the Perennial Plant Association* and that's pretty cool! While P virgatum 'Northwind' is relatively new to the garden scene (1992), Panicum virgatum has a long history on this continent. It's native to the tall grass prairies of the Great Plains from the Rocky Mountains to the Atlantic Ocean and along with big bluestem, little bluestem and Indian grass. It was grazed by herds of bison, deer and elk and can still be found growing in ‘remnant prairies’ and along interstates throughout much of North America. It's rather ironic that it took European plant breeders to open our eyes to the versatility and beauty of Panicum virgatum. They've brought us lovely cultivars and spurred American breeders to get on the native grass bandwagon, but, that's not the case with 'Northwind'. Roy Diblik, of Northwind Farms selected it from a population of Panicum virgatum he raised using wild-collected seed. It had wider leaves and a very upright growth habit unlike other panicums that tended to arch. I am very appreciative of his efforts, 'Northwind' is a stellar cultivar! I love the panicums and have many in my garden. ‘Northwind’ is without a doubt the most upright of all the cultivars that have been introduced in the last dozen years. That's probably been it's best selling feature, a tall grass that fits beautifully into small or larger gardens. What makes this grass especially attractive to me is its color change from summer through late winter. In my garden it begins to golden up in September just in time to compliment the purple ex-asters, the reds of Iteas and Aronias. The fall color is especially gorgeous in the late afternoon when it's backlit by the setting sun. It's a tawny gold for several months, but, by the end of the winter it's a striking pale blonde that looks incredible in my almost brown landscape! It's also the best time to cut it back! 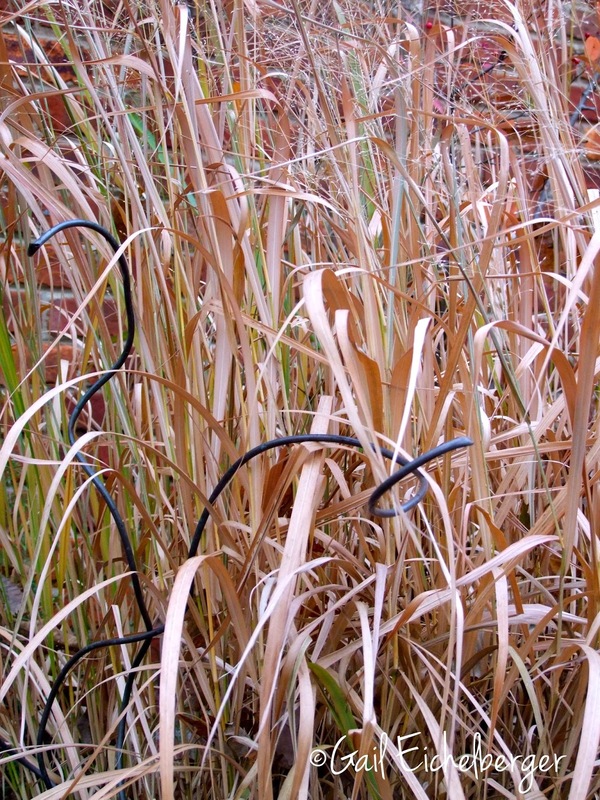 Late winter is the ideal time to cut your ornamental grasses, just before the new shoots emerge and you risk clipping them off with your shears. Please don't be like many of my Nashville neighbors who allow the mow and blow crews to scalp these beautiful plants to a stub in mid fall! 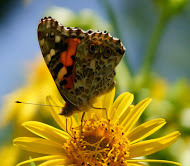 Think of all the marvelous color changes you would miss and besides the critters need the shelter those golden/tawny/blonde blades offer them all winter. Thank goodness it won't be long before they start greening up! I miss them terribly when I have to cut them back, but, before long the beautiful olive-blue green leaves will be back helping showcase Itea, the ex-asters, Vernonia, Juniperus, Rudbeckia, Phlox, River oats, Hypericums and the other rough and tumble wildflowers that make their home here at Clay and Limestone. Gail Eichelberger is a gardener and therapist in Middle Tennessee. 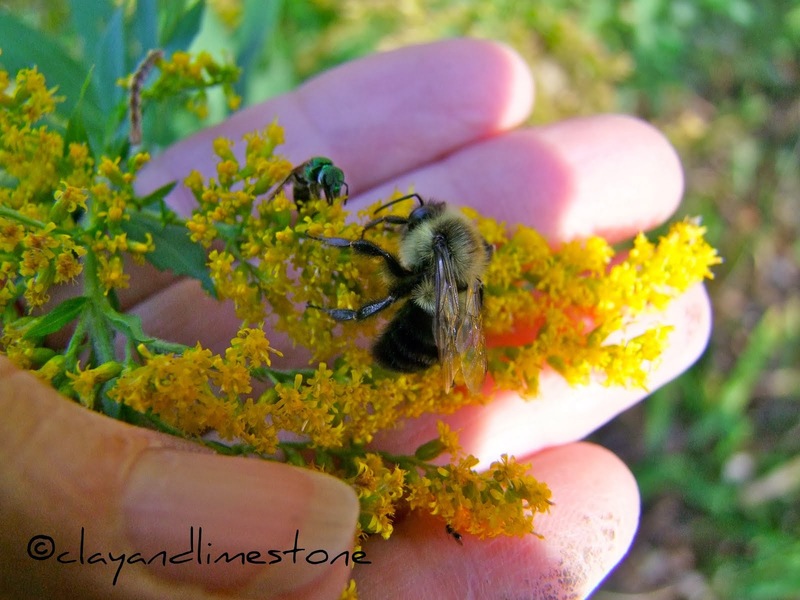 She loves wildflowers and native plants and thoroughly enjoys writing about the ones she grows at Clay and Limestone. She reminds all that the words and images are the property of the author and cannot be used without written permission. What a trooper! I wonder why I don't see it offered here in south central Texas? It really is practically perfect. What a great plant. I have two separate stands of it. I love seeing yours with the purple/blue bottles behind. I love all the Panicums, I think it's my favorite grass. Most of mine stay upright, and they're a perfect height. That shot of it glowing in the sun with the blue bottle tree behind, WOW! 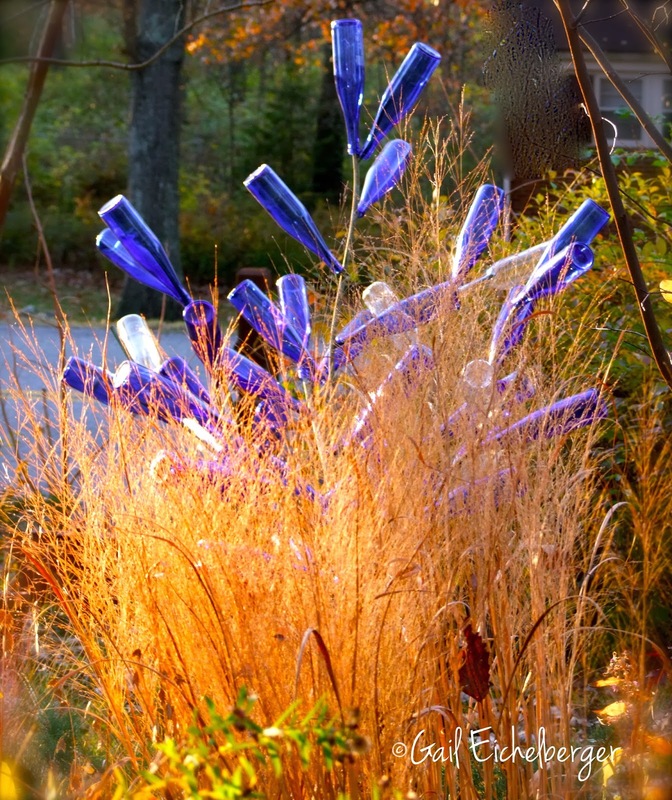 Gorgeous--especially the fall color and as a compliment to your blue and purple flowering plants and garden decorations! I love the pictures, the information, and the alliteration of the post's title! 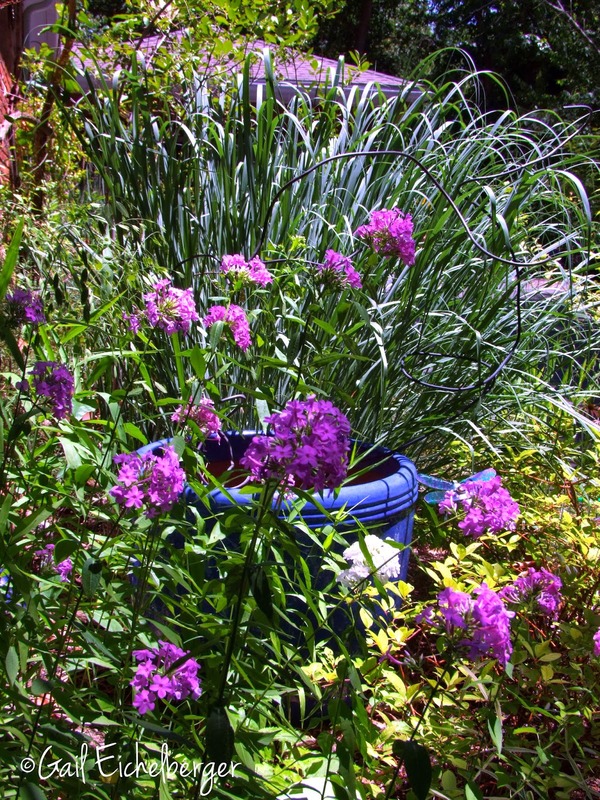 Good timing -- I'm planning to add about 5 of these Northwind Panicums to my garden this month. Really looking forward to having more ornamental grasses. I love that Diblik found the original 'Northwind' growing in a waste area next to railroad tracks. It is a wonderful plant, and I have someone in my garden. I'll be trimming them back in a week or so. This looks so pretty especially the blue color flower. I'm a big fan of the panicums, too. I don't have 'Northwind,' but I purchased two 'Shenandoahs' a couple of years ago which could be 'Northwind's' twins. I knew nothing about panicums at the time and certainly didn't know they were natives, but picked them out of the grasses selection at a local nursery just because I thought they were beautiful. I'm so glad I did; as you say, their color changes through the seasons add so much to the garden, especially in the fall and winter. Beautiful photo of their seed heads! I will be keeping my eye out for 'Northwind'. I need more grasses here. It really is a great choice for Perennial of the Year. Good to see how beautiful it is in your garden - and it's just as lovely up here in the frozen north. Thanks for reminding folks to go easy with their fall clean-up too. 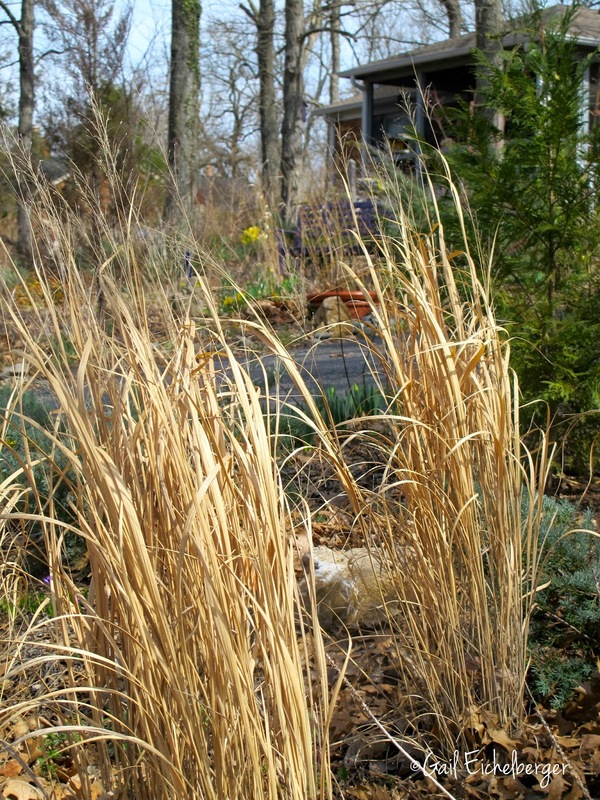 It has such a pretty colour and habit throughout the winter - and providing your snow isn't over your head, it is one of the few grasses that provide winter interest in the snow belt. B. This is one of my faves too. I am with Barbara and wonder why some "gardens" chop these gorgeous grasses way too early in the year .. I have seen it here in Kingston in fact and it is sad because they look so wonderful waving in the breeze with a combination of such pretty colours running through them. I have quite a few in my gardens ... I love ornamental grasses and can't get enough of them ! Joy (from the frozen north on the eve of yet another HUGE winter storm) BIG sigh ! North wind is a GREAT panicum. Most of my Panicums flop like crazy, but not Northwind. 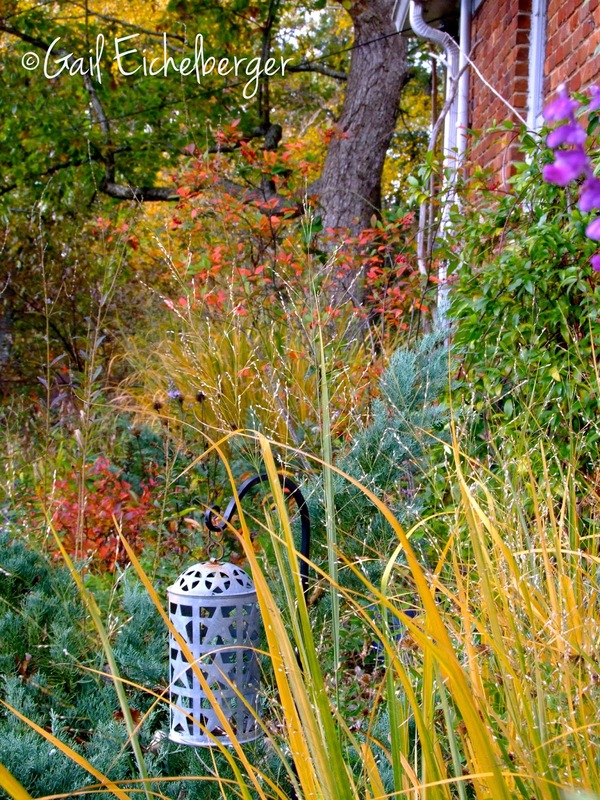 Your autumn pictures of Northwind in your garden are incredible.